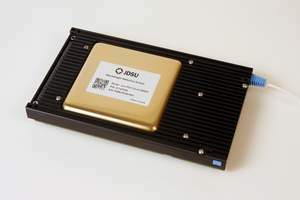 MILPITAS, CA--(Marketwire - February 3, 2010) - JDSU (NASDAQ: JDSU) (TSX: JDU) today announced its next-generation wavelength selective switch (WSS) module, the Mini 50 Gigahertz (GHz) WSS. Providing optical components that help network equipment manufacturers and service providers optimize networks has become increasingly important as consumers continue to access more bandwidth-intensive applications, such as video, over the internet. The Mini 50 WSS represents the next generation of JDSU 50GHz WSS modules that have been deployed in networks worldwide since 2003. These modules have proven optical performance and reliability in routing and managing network traffic. JDSU WSS modules are the only ones that are carrying live 100G network traffic today. The new module comes in a smaller package with increased functionality to support more sophisticated mesh network architectures. Testing of the Mini 50 WSS in JDSU's lab has proven that it can support network traffic through more than 16 nodes, or entry and exit points in a network, with minimal effect to the network signal. It is projected to be able to support or 'cascade' a signal in up to 26 nodes. The Mini 50 WSS became commercially available in December 2009 and is currently in various phases of implementation with several network equipment manufacturer customers. "JDSU's Ottawa-based R&D team continues to be at the cutting edge of WSS technology," said Gurpreet Mand, director of ROADM Products for the CCOP business segment at JDSU. "The Mini 50 WSS is yet another example of a next generation solution from JDSU that has a platform that is highly scalable to support emerging applications." --  1 X 9 port configuration. --  Compact with reduced height and smaller form factor. --  Designed for lower cost and high volume production. JDSU (NASDAQ: JDSU) (TSX: JDU) enables broadband and optical innovation in the communications, commercial and consumer markets. JDSU is the leading provider of communications test and measurement solutions and optical products for telecommunications service providers, cable operators, and network equipment manufacturers. JDSU is also a leading provider of innovative optical solutions for medical/environmental instrumentation, semiconductor processing, display, brand authentication, aerospace and defense, and decorative applications. More information is available at www.jdsu.com.